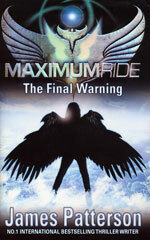 I love the Maximum Ride series, and I was delighted when this new fourth book came out - I thought it was a trilogy! It's still the same crazy team...six bird kids and their malevolent enemies chasing round the world. Max is the leader of the flock, feisty and fierce, but at least she now has her mom who she knows she can trust. Somehow we were pressed together, Fang's arms around me now, sliding under my wings, his hands flat against my back. It was incredible. I loved it. I loved him. It was a total disaster. Gasping, I pulled back. 'I, uh-,' I began oh so coherently, and then I jumped up, almost knocking him over, and raced down the dock. I took off, flying fast, like a rocket. ...a transparent person, with his organs and stuff in clear Plexiglas boxes, and his head attached to one by an almost-bare spinal cord. He was sitting - or stacked, more accurately - in a customized wheelchair. Looking closer, I saw that his guts and stuff were surrounded by and connected to machine parts - hoses, pumps, electronic things. And yes, it was totally as gross as it sounds. If I hadn't already seen a million incredibly gross things in my life, I would have barfed right there. The world isn't saved yet, is it? You've got work to do. Now, get out of there, and I'll give you the coordinates of where you need to go. Who is that Voice anyway? Brilliant! Such a fun read! Is there anything else as sharp as this on the bookshelf?